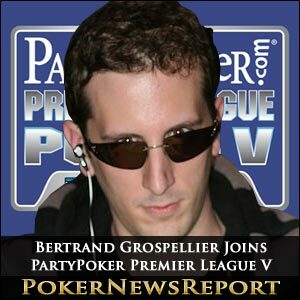 Superstar poker player Bertrand ‘ElkY’ Grospellier will add some French flair to the upcoming PartyPoker Premier League V after it was announced the Triple Crown winner had been added to the already-stellar line-up for the Vienna event. The 31-year-old Team PokerStars Pro – who is “super excited” to be making his debut in the event – joins an incredible list of pros already signed up to the $125,000 buy-in tournament that will run from April 4 to 10 at the Austrian capital’s Montesino. Really, it’s difficult to know where to begin when listing the pros already committed to the exciting event, so here’s the confirmed line-up so far: Phil ‘The Unabomber’ Laak, Tom ‘durrrr’ Dwan, Daniel ‘Jungleman’ Cates, Patrik Antonius, Luke ‘FullFlush’ Schwartz, Erik Seidel, Sam Trickett, Team Party Poker Pro Tony G, Yevgeniy Timoshenko, Eugene Katchalov, Team PokerStars Pro Vanessa Selbst, Andy Frankenberger and, of course, London-based Grospellier. Frankenberger won November’s $25,000 Premier League Poker Mixed Game Championship in London for $100,000 after seeing off fellow final table players Andrew Feldman, Sorel Mizzi, Max Pescatori, James ‘Flushy’ Dempsey and Matt Giannetti, although that sum will come nowhere near the top prize in Vienna next month. Just one more pro will be added to the 16-player line-up before the start of the event – which is to be presented by lovely Team Party Poker Pro Kara Scott – on April 4, while two players will qualify via the televised play-offs. The tournament is also scheduled to kick off before the PartyPoker.com-sponsored World Poker Tour (WPT) Vienna €3,500 buy-in main event is staged between April 10 to 15, while the Party Poker Big Game VI begins on April 11 for a 48-hour event. Meanwhile, the WPT’s executive tour director Matt Savage, who has been confirmed as the WPT Vienna main event tournament director, will also oversee the Premier League event. Additionally, the American – who finished fifth for $32,396 in the 2009 WSOP event #53, a $1,500 buy-in Seven-Card Stud Hi-Lo-8 or Better tournament, in Las Vegas – expects to see an increase in numbers for the latest WPT main event from last year’s 555 starters in the Montesino Pokertainment Centre, when Russian Dmitry Gromov pocketed $636,733 for taking down the €3,200 buy-in event. Now, if you have the urge to take a shot at the biggest names in poker, this weekend will be your last chance to qualify for the WPT Vienna main event with Party Poker. Each prize package is worth $7,000 and includes the $4,700 main event buy-in, six nights’ hotel accommodation and $900 in spending money.